Don't Let Dirt Destroy a Work of Art! A fine woven area rug may have hundreds of artisan hours, and thousands of your dollars invested in it. Over time, sand and dirt collect deep in the pile, grinding away the fibers and wearing it out prematurely. Improper “surface cleaning” of the rug may cause fiber damage or dye bleeding. Want a Clean, Fresh, Baby-soft Rug? At Coslett's we use a specialized rug duster first to remove 90% of the soil before we wash it. Then, we hand-shampoo and cold-rinse the rug to protect the dyes and fibers. We detail the fringes, speed-dry it, and return it to you soft and fresh. Dust your rug (over 70% of the cleaning process involves removing dust). Lay the rug face down on a grid mat and gently beat the soils from both sides. Also, using a beater bar vacuum on each side, we will loosen and remove embedded soil particles from the base and backing of the carpet, which will allow the pile to become open and fresh. **Note, extra care and special attention is given to hard to remove stains and odors. 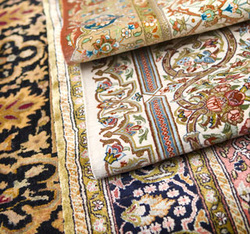 Every rug goes through a preliminary inspection to determine the condition of the rug. Based on the results, we then decide which specific treatment(s) will be applied (e.g., stain treatment, urine removal enzyme treatment, odor removal ozone treatment, etc.). For example, pet urine stains and odors are treated with an enzyme treatment and/or ozone odor removal treatment. We will pre-test all rugs for color fastness BEFORE cleaning. Some rugs that are not colorfast (particularly silk and some wool) may need to be dry cleaned. Wool and cotton are NOT as stain resistant as nylon or olefin fibers that most installed carpet is made from. Therefore, wool and cotton may have permanent stains that cannot be removed with cleaning. Fringe will be hand cleaned as best as possible. For your convenience, we offer pickup for your fine wool, silk, cotton, nylon, or olefin rugs for full service cleaning. With full service cleaning, we can spend more time soaking your rug if necessary and can perform a second or third cleaning if needed. A hand washing reduces moth larvae that eat up wool rugs. Excessively soiled rugs and/or rugs with odors problems particularly benefit from this service.